If a student is getting Bs in school, will giving him a home computer, if he doesn’t have one, bump his Bs up to As? Most likely not. That's what the authors of a working paper released by the National Bureau of Economic Research concluded. As part of this study, several hundred students who did not have home computers were given computers to see if the devices would have any impact, positive or negative, on their academic performance. The researchers found that this action didn’t have any positive effects on a whole host of educational outcomes, including grades, standardized test scores, credits earned, and attendance. It's important to note that the computers in the home could have had positive effects that weren’t captured by the specific measures the researchers used. For example, the devices could have helped students and their parents find information about jobs, colleges, and any number of other subjects. Computers could have helped students connect with their educators and other students. They could have helped students learn about subjects and ideas that were not measured by grades. The study, the largest of its kind involved 1,123 students in grades six through 10 attending 15 schools in California, mostly in the Central Valley. Many of the schools had higher percentage of poorer students than the average California school. For instance, 81 percent of the students were on free and reduced lunch plans. Half of the students were randomly selected to receive a free computer while the other half served as a control group. Since the purpose of the study was to evaluate the role of the home computers alone, no training or assistance was provided on how to use the computers. At the end of the school year, the researchers looked at data provided by the schools to see what effects the computers had on various educational outcomes. Researchers also conducted a survey of the students at the end of the year to glean information on how they used the computer and their homework efforts. In addition to the computers not having any impact on grades, standardized test scores, credits earned or attendance, students with the computers didn’t spend more, or less, time on homework; nor did these students turn in their homework more as a result of having a computer. While computer use in schools is widespread, with an estimated $5 billion a year being spent on computers and information technology in schools (the figure depends on your source), nearly nine million children, particularly low income children, do not have computers at home, according to the paper. So, improving access to technology is often seen as a way to close the achievement gap between poor and more well off students. But previous research, including work Fairlie has done, on the role of computers and educational achievement is mixed. Some studies have shown positive effects on grades and other outcomes, while almost an equal number show negative effects. Most of that work involved statistical analysis, Fairlie said, taking existing data on who owns a computer and who doesn’t, crunching numbers and controlling for other factors, such as income and parents’ education. His first experiment in this area involved 286 community college students, half of whom received home computers. “I found small positive effects on educational outcomes, nothing really large, but there was some evidence across a lot of different measures of modest size positive effects,” he said. For example, the computer owning students were more likely to take classes for letter grades rather than for pass/ fail. Owning a computer didn’t have much of an impact on grades however. In this larger sample of students, there were no positive effects. On the flip side, the computers didn’t seem to have any negative effects either. Fairlie said there may have been more positive and negative effects, but they could have canceled each other out. 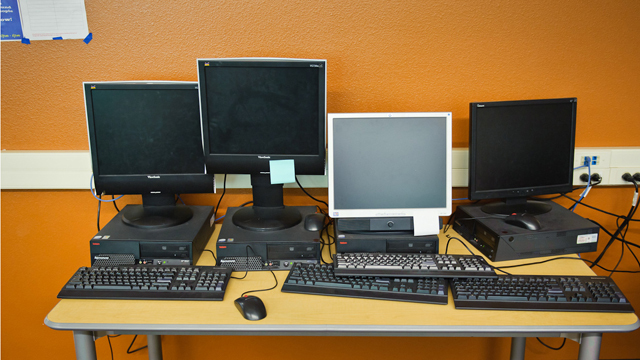 For instance, the students in the computer group used the computers to complete school work but they also spent more time playing computer games and using the computers for entertainment purposes. “So the computers may have helped them complete school work but also displaced some school work that they would have otherwise been doing, or some studying,” he said. Eric Sheninger, principal of the 660-student New Milford High School in New Milford, New Jersey, said he wasn’t surprised by the findings. The results may have been different had the students had some guidance on how to best use the computers and if teachers had been involved in connecting the home computers with what was going on in the classroom.